A larger engine, or a smaller engine? Sportbike, cruiser, mod bike, dual sport, dirt – there are so many different specializations within motorcycling that without riding them – how do you know what is right for you? Working in a local dealership, selling motorcycles in my early 20’s, I got exposed to a lot of different reasons why a person was wanting this bike or that – a regular answer I got when I asked, “why are you interested in this bike” – is because their friends said that that was the one to buy. There is a lot of bias behind that, and with so much selection, you should consider what type of rider you will be with. Obviously, if you get a dirtbike, and your friends ride street – you won’t be going on a road trip with them, and they won’t be climbing up shale mountain sides either. One of the great things about motorcycles is the friends you have, the friends you meet, and the strangers that become friends. It’s a great kinship, and maybe something selfish to say, but go for the motorcycle that suits you best. If you haven’t taken a motorcycle safety course yet – do it. A big benefit is that they provide a variety of styles of motorcycles to learn on – especially more beginner-friendly sizes that bear a lighter weight and are easier to maneuver. “Wait until you get a normal sized bike,” I’d whisper in a reply and cue their large eyes staring in disbelief. This is from all kinds of people, so something to keep in mind if you’ve never touched a bike. If you have, well you are a few steps ahead of the game, but still take a course to iron out a lot of the initial awkwardness that comes with handling a bike. With these courses, if you are listening and following instructions and happen to drop the bike, 99% of the time you don’t need to worry about it. The exception here is the odd school with a strange clause that says students fix all repairs, but I’ve never seen that. Odds are I’d steer clear of ever teaching or learning at a school like that because that’s just craziness. There are certain times where I’ve had students take the course and decide that it’s not for them – but the great majority of the time they start the most amazing, albeit potentially dangerous, journey of their lives – becoming a motorcyclist. The first time inside a motorcycle dealership can be intimidating – but it is also an opportunity. Hopefully, you end up speaking with an educated salesperson, as they will take the time to listen to you while thinking about your preferences and needs that might steer them to pointing out one bike model over another. Go in with an open mind, but also make sure you don’t believe everything you are told either. I teach my students that motorcycling is a huge grey area for the most part and it’s not black or white or set in stone that something is a particular way and only that way. Learn to be flexible in your thinking when deciding to purchase your first bike. Otherwise, you might end up with a bike that’s less than ideal. I’ve seen people come into the dealership set in their minds on buying a GSX-R 1000 (known to bikers as the Gixxer 1000), which is not an ideal bike unless you are the size/weight of Lebron James. 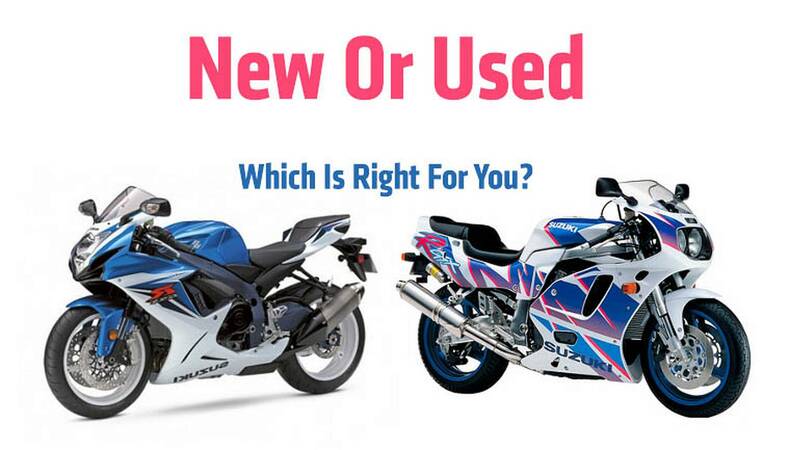 In that case, I’d say a larger bike is better because you’d look like you are riding a pocket bike otherwise. Not only is it good to have the book smarts from doing your research beforehand, but also experience and feel them firsthand too. I say bikes because the biggest thing I would suggest is to sit on different styles of bikes to see how comfortable you are going to be. Don’t just one and done with a single bike. With there being all sorts of styles of bikes, there is also going to be different ergonomics or the way your body is positioned on the motorcycle when moving and stopped. Try as many as you’re allowed. Basic etiquette in a dealership is to ask a salesperson to bring it out the bike or if you can sit on it. I cannot explain how irked the owners (and admittedly myself) would get when you turn around to see John Doe sitting on the $40,000 Benelli display model with their huge belt buckle engraving a “how do you do” mark into the tank. I get chills all over again when I think about that. You don’t know if that bike belongs to the dealership or a customer. That bike could belong to a customer – and if you think about it – the most taboo thing is to sit on another person’s bike without their expressed consent. It would be like me wearing chainmail, eating a huge messy ice cream cone and hopping onto the hood of your Cadillac and rolling around (maybe that’s a slight exaggeration but… no, actually, no it’s not. It is the same thing). Testing out a motorcycle is not the same as testing out a car. It is easier to damage a motorcycle with inexperience than it is a car. Motorcycles have two wheels and usually do not balance on their own without a kickstand or something/one holding it up. Cars don’t have that issue and don’t fall on their sides and damage themselves from a moment’s inattention. This is why car dealers allow test drives and bike dealers 99% of the time don’t. Unless it is a used bike and they are willing to let you test ride or a manufacturer demo. There are arguments for both. If purchasing a smaller engine beginner bike, research popular models as those would likely keep their resale the best. Yes, it may be good for the first season before you start to want something more, but an advantage to a smaller bike is that you can develop the riding skills better than if you were to jump on a bigger one right away. Main reason? Speed bikes balance themselves and there is very little rider input. You would learn that in a riding school or one of my articles about riding (links at the bottom of the article). If you drop it, there will be a lot of tears. Known fact. If you don’t cry – someone in the world would be crying for you because it’s a new bike that is no longer new and the pretty details are now scratched or ruined and you will be embarrassed. Don’t worry, someone already has the incident up on Youtube – you’re not alone. Please note: I have a very dry sense of humor if you haven’t already noticed. The break-in period. If you don’t do it properly, the bike is in for a very short lived life. It is a painful time of holding back your biker instincts, but trust me, it’s worth it. That’s a trick question, do you even know what I just asked? Probably not, and for the average person I wouldn’t expect you to – nor would you require to know. These two bike models I listed are the same – yet completely different. I included a picture for reference to what this paragraph title is because to most people it looks the same, yet it’s completely different between these two model years. Will this make a difference to a brand new rider? Likely not because a new rider is still focusing on what controls do what and learning to understand the operation of it, let alone the little nuances that would set these two motorcycles apart. There are going to be not only different models of motorcycles but different options on them. Not unlike buying a car, there is going to be differences that may make a difference in whether the bike is for you or not. Maybe you are set on ABS (personally not a fan – but everyone likes different flavors), and a particular bike you like the look of doesn’t have it. Can you adapt and live without that option, or do you need to change to something else? These are some questions to ponder while looking at your local ads or strolling through your local dealer. Should I Opt for a Dealer or Private Sale? This is tough, but unless you are a mechanic or know one – or request to have the bike looked at by one (on your own dime usually), you may or may not get a lemon of a bike (meaning looks great but you make a sour face once you realize it needs something big that the seller was hiding). With either, it is going to be 99% unlikely that a person or a dealer will let you ride the bike before buying it, as you don’t know what will happen with the bike once it’s around the corner or even a few feet down the driveway (I’ve seen guys dump their bikes so many times I can’t even count as they were riding away after going over everything with them – so early lesson, don’t let pride and ego get in the way of doing things right). You will thank me later. Pretty much with used bikes, you will want to make sure that the engine isn’t warm when you see it start up. A warm start can hide all sorts of preliminary issues (such as improper jetting on a carbureted bike, smoke, etc), that could save you time and money by noticing these things right away. Sometimes it’s not something to completely avoid – especially if you are getting a steal on the price – but to be aware you might have to sink some extra cash into getting it working well. Kelleys Blue Book (you’re welcome) can give you a good idea of what is a fair price, but there will be outside factors as well. This generally works best as a point for private sales only. Dealers work a little differently. I’ll get to that in a bit. Back to private sales. Other things to look for in a private sale, is the engine too clean? (There might be signs of a gasket leak that someone tried to hide), what condition are the chains/sprockets in? Are the sprockets worn to a point or chipped – you might want to take note as that it minimum a few hundred dollars to replace the front and rear sprockets. Fluids, how light/dark are they? (Darker fluids mean older and maybe not changed as often – giving away how the bike was taken care of). If you’re not sure about these things, you can always reference this article on bike mechanics. Tires and tread depth, tire pressure, leaks on the forks, and brake sponginess (front and rear) is another thing to take note of. The more you educate yourself on what it should be versus what it is – the less likely you’ll end up purchasing someone else’s problem. More importantly: Does the VIN (vehicle identification number) match on the sticker on the frame as well as the engraved VIN (usually located on the triple tree or the part of the frame furthest to the front of the bike – this does vary manufacturer to manufacturer). Ask to see the paperwork. Any legitimate owner will not hesitate to provide that to show that the bike was purchased by them and they are the registered owner. If they don’t, I would suggest walk away. Will those questions make or break the purchase? Not necessarily – this is where some common sense and gut instincts come in handy. Do they have service records? If so, bonus! If not, you may want to ask where the bike was serviced – or if self-service, you make want to request a recent (within a few weeks) inspection/or offer to pay to have it checked by a mechanic (some dealers will pick up and assess a bike in exchange for cash). What if they didn’t use the right oil, or filters, or aftermarket vs stock parts and what is likely to fail? Will you know that? Spending a few hundred on inspection could save a few thousand dollars wasted on unknowns). Well, there are a few right answers to that. First would be broken in as the manual says and serviced at the specified intervals, or broken in like you would ride it in progressive steps varying the rpm and servicing sooner and more frequently than recommended (seating the pistons reacts differently in both situations and under the harder riding, it will condition the bike better but there will be more bits of metal in the bottom of the oil pan that needs to be changed sooner to prevent issues). I can say I’ve caught some people in a lie as there are telltale signs of a dropped bike, and how it was likely dropped. Being dropped while dead still because your foot slipped on gravel is different than being dropped on the highway, full speed and hitting the ditch. Generally, frame/parts scratches will be longer and deeper the faster and harder the crash is. Another reason to order a history report and check the VIN because if the bike was written off and issued a new VIN from that State or Province, the VIN will not be the same as what the manufacturer would have on the frame and you should only be paying at the very most – half the value of the blue book price or if they were trying to hide that part, again, walk away. VIN wiping is basically taking the VIN from one bike and transferring it onto another through very illegal means. This is a way for criminals to make money off stolen bikes and have it appear to be a legitimate purchase. If the VIN sticker or engraved portion looks like it was tampered with or both VINs do not match, do not purchase it. Basically, the biggest pro to purchasing privately should be cost and overhead savings (if you take the proper precautions and know what you are doing), the biggest con is that you are not guaranteed any sort of warranty and it’s pretty much no refunds or returns once purchased. So buyer beware. In a good dealership, you’ll not only build a relationship with the sales staff but parts and service staff as well. Yes mistakes can happen, but how it is dealt with and how fairly by both parties, because let’s face it, you can’t expect caviar and champagne to come with a bargain price motorcycle – let alone a top end one) – what you can expect is honest and direct answers (you may not like the answer, but if it’s honest, sometimes a little flexibility goes a long way in relations). This is a sign of a dealer that cares. Important: Please make sure to be familiar with what might void your warranty and the length of the warranty, and that there may be aftermarket or OEM (manufacturer) warranties available to purchase or if you’re lucky a promotion might come with it. A lot of the time they will also have some sort of customer incentive programs with ties to various outside connections such as insurance or events. Please let common sense be your guide with any of these situations and if you aren’t sure, have someone with you that knows. If you are brand new, taking time with someone who is educated about parts and accessories will ensure that your helmet fits right. I can’t name how many students come to my motorcycle course and it turns out the helmet is three sizes too big and they wasted $500 because you cannot exchange or return a helmet. I strongly recommend that you do not buy a used helmet. Avoid any dealerships that sell them. Buying a used bike is one great thing, but buying a used helmet is always a no-go to always keep in mind. All my prior helmets are now part of my decor as I wouldn’t sell them privately out of integrity – unless I knew for a fact it never was dropped. I would personally never know, therefore I don’t sell privately. Returning helmets is a no-go for one single reason. If dropped once, from even a few inches high, the shell may become compromised. The dealer does not want to be responsible for that. There are no tell-tale signs usually on if that did happen, so refusing to take a helmet that’s left the dealer is always the safest bet for all parties.